Roussos et alArticle demonstrate decreased expression in genes associated with the integrity of the nodes of Ranvier in schizophrenia. Using 3 different cohorts, they show that a genetic variant in ANK3, which is associated with risk for bipolar disorder, is associated with decreased expression of ANK3 messenger RNA in the human brain and higher risk for schizophrenia and poorer cognitive performance as well as increased prefrontal activation during a working memory task in healthy individuals. 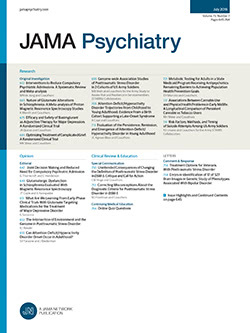 In a 2-year longitudinal magnetic resonance imaging study, Arango et alArticle report that patients with first-episode, early-onset psychosis who end up with a diagnosis of schizophrenia had greater gray matter loss in several brain areas compared with healthy controls. This was not the case for patients with bipolar disorder. Greater gray matter loss was related to variables indicating poorer prognosis. Bhattacharyya et alArticle examined the neural basis of the effects of cannabis on salience processing and psychotic symptoms using functional magnetic resonance imaging in conjunction with experimental administration ofΔ9-tetrahydrocannabinol and cannabidiol. Their findings suggest that the acute induction of psychotic symptoms by cannabis was related to the modulation of striatal and prefrontal function during salience processing byΔ9-tetrahydrocannabinol, while cannabidiol had an opposite effect on these regions. Elliott et alArticle used functional magnetic resonance imaging to show that unmedicated patients who had remitted from major depressive disorder had reduced medial prefrontal responses to scenes depicting positive and negative social interactions. Similarly reduced responses were not seen to scenes matched for emotional valence but depicting individual successes and failures. Autism spectrum disorders (ASDs) have been suggested to represent the extreme end of a normal distribution of autisticlike traits (ALTs). Lundström et alArticle capitalized on twin methods and showed a correlation between ASDs and ALTs. In addition, this correlation was primarily affected by genes, giving no evidence for a clear etiological demarcation between ASDs and ALTs. Nordahl et alArticle conducted a longitudinal magnetic resonance imaging study of amygdala and total brain growth rates over a 1-year interval in very young children with autism. They found that, on average, children with autism demonstrated an abnormally rapid rate of amygdala growth at 3 to 4 years of age. However, there was considerable heterogeneity within the autism group: 40% of children had faster growth, 40% had normal growth, and 20% had slower growth. Bevilacqua et alArticle describe how childhood trauma and variants in the FKBP5 gene interact to increase risk for overt aggressive behavior. FKBP5, a regulatory gene of the hypothalamic-pituitary-adrenal axis, harbors putatively functional alleles that have been associated with increased protein expression and increased glucocorticoid receptor resistance. This study indicates how FKBP5 high-expression variants may modulate the lifetime history of aggressive behavior in Italian male prisoners exposed to physical abuse during childhood. Ohayon et alArticle examined how changing the definition of excessive sleepiness and adding criteria of frequency and severity better identify groups of individuals at higher risk for daytime impairment and comorbid psychiatric and medical conditions. The findings support the enlargement of the definition of hypersomnia disorder in the future DSM-5 classification. Olfson et alArticle report on national data from adult Medicaid beneficiaries presenting for emergency care of deliberate self-harm. Most (62.5%) were discharged to the community. Approximately one-half (47.5%) of discharged patients received a mental health assessment in the emergency department and only 52.4% received outpatient mental health care during the following 30 days. Mercer et alArticle report a gene × environment effect on posttraumatic stress disorder symptoms when examined in a relatively homogenous sample with shared trauma (a college campus shooting) and prospectively measured, preexisting symptoms. Posttraumatic stress disorder symptoms within 2 to 4 weeks after the traumatic event, indicative of acute stress disorder, were associated with the serotonin transporter (SLC6A4) genotype (combined 5-HTTLPR and rs25531) along with severity of the trauma exposure. Buchhave et alArticle evaluated the prognostic value of cerebrospinal fluid biomarkers in a cohort of patients with mild cognitive impairment. Around 90% of patients with mild cognitive impairment with pathological cerebrospinal fluid biomarkers at baseline developed Alzheimer disease within 9 to 10 years.β-Amyloid 1-42 levels were already fully decreased at least 10 years before conversion to Alzheimer dementia, while total tau and phosphorylated tau seemed to be later markers. These results indicate that alteredβ-amyloid metabolism precedes tau-related pathology and neuronal degeneration.